Pancreatic cancer accounts for about 3 percent of all cancers, but it's now the third-leading cause of cancer death in the United States. Its prevalence has risen by about 0.5 percent annually for more than a decade. The rise in pancreatic cancer and other pancreatic disorders consumes an incredible amount of time, energy and resources by our staff, as well as causes serious anxiety to our patients. That's why we're excited to welcome Jordan Winter, MD, who joins us as Chief of the Division of Surgical Oncology at University Hospitals Cleveland Medical Center and Director of Surgical Services at University Hospitals Seidman Cancer Center. Dr. Winter's mix of surgical and scientific skills and bedside manner make him a great asset to UH. University Hospitals Digestive Health Institute wants to standardize patient care regardless of condition. But because many guidelines around pancreatic cancer and disorders remain unclear, we've marked it as an area of focus. Many patients with a pancreatic disorder assume they'll get cancer. Although some cysts become cancerous, most don't. Early intervention is the only way to prevent this disease, and identifying which patients would most benefit from surgery is key to providing high-quality, value-based care. Dr. Winter worked with our team to create a set of guidelines that will bring value to our patients and improve their experience. Those guidelines will also provide assurance we're making the best choices when treating pancreatic disorders and cancer. To provide quality care closer to home, UH Digestive Health Institute is expanding its services throughout Northeast Ohio. We've attracted midlevel career and recent medical school graduates who will be based in various UH community medical centers. These professionals have all the qualities we look for in providing high-value digestive health care. UH Digestive Health Institute also continues to pursue research to advance new and novel treatments for digestive and liver disease. Dr. Winter will soon begin enrolling patients for a Phase II clinical trial to study a potential new drug to treat pancreatic cancer. Fabio Cominelli, MD, made significant progress over the past year on a potential new treatment for inflammatory bowel disease (IBD). The EsoCheck device, a novel screening method co-invented by Amitabh Chak, MD, has made further progress. U.S. News & World Report consistently ranks UH Digestive Health Institute as one of the top 25 hospitals in the nation for treating digestive and liver disease. 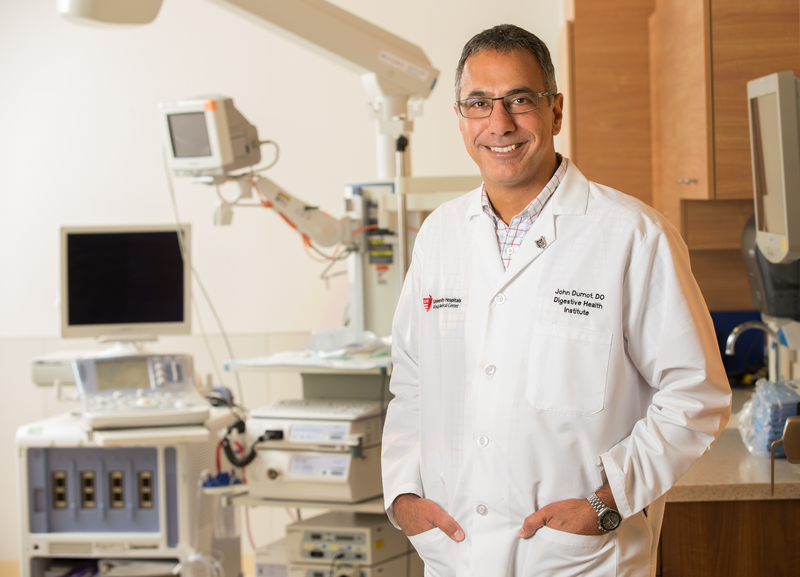 UH Digestive Health Institute is proud to have such a dedicated team of physicians, educators and researchers — including professionals that juggle two or three of these roles — dedicated to UH's mission to heal, teach and discover. As a department, we continue to emphasize quality, appropriateness of interventions and privacy for the patient.